For other uses, see Beetham (disambiguation). 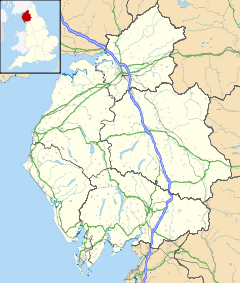 Beetham is a village and civil parish in Cumbria, England, situated on the border with Lancashire. It is part of the Arnside and Silverdale Area of Outstanding Natural Beauty. Craven in the Domesday Book shows that up till 1066 Earl Tostig was lord of Beetham and the surrounding areas of Farleton, Preston Richard, Hincaster, Heversham and Levens in Cumbria plus Yealand Redmayne and Borwick in Lancashire. Beetham manor then amounted to 25 carucates (ca3000 acres/1250ha) of ploughland. The Norman conquest of England added it to the extensive lands of Roger de Poitou. The parish had a population of 1,724 recorded in the 2001 census, increasing to 1,784 at the 2011 Census. The Church of St Michael and All Angels, parts of which date from the 12th century. The Heron Corn Mill, a working watermill and active arts and education center. The Heron Theatre, an 80-seat theatre housed in the listed 18th century grammar school . The Fairy Steps, a natural staircase in a limestone crag, in the woodland to the west of the village. A small shrine to Saint Lioba (or Leoba), built into a stone wall in the nearby hamlet of Slackhead. The River Bela flows past the village and through the deer park of Dallam Tower, skirting Milnthorpe before it washes out into the Kent Estuary near Sandside. Half a mile to the south-east, Beetham Hall is a 14th-century fortified manor house, now largely ruined, adjoining later buildings. To the north of the village is the Billerud paper factory employing 140 people and producing 45,000 tonnes/year, specialising in kraft paper for pharmaceutical and food packaging. The civil parish of Beetham includes the main villages of Beetham and Storth and the smaller communities of Carr Bank, Sandside, Hale, Slackhead, Farleton and Whasset. ^ "Parish population 2011". Retrieved 9 June 2015. ^ "Beetham Hall". britishlistedbuildings.co.uk. Retrieved 2011-03-08. ^ "Beetham, UK". Our production sites. BillerudKorsnäs. Retrieved 18 April 2013. Wikimedia Commons has media related to Beetham. This page was last edited on 1 April 2017, at 12:07 (UTC).